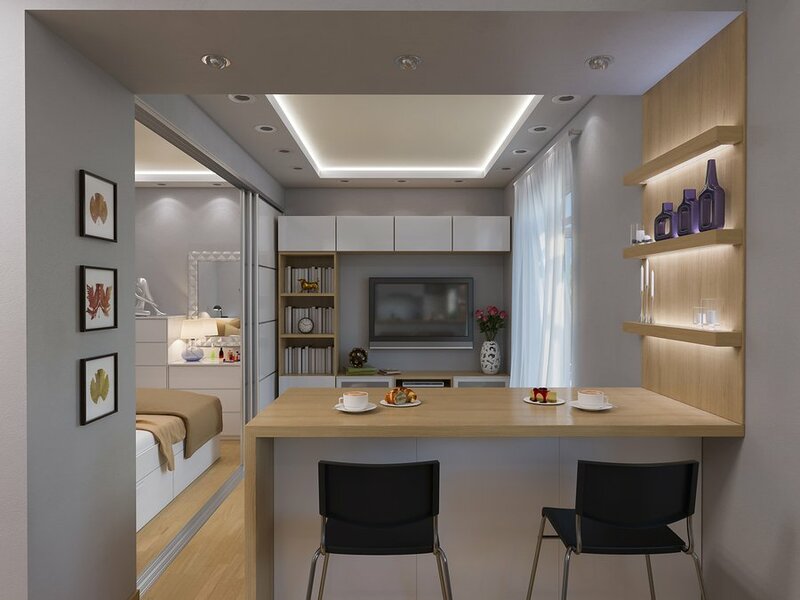 A rental lease contains all the important rules and conditions for living at a rental property, one of the most important being the length of the lease agreement. Lease agreements range from fixed-term to month-to-month. The length of a lease term is typically determined by the landlord or property manager. Renters have the option to negotiate with their landlord or property manager to change the length of the lease term. For instance, a property might be advertised as a year-long lease, but a renter can ask the property manager if they can sign a 6-month or month-to-month lease instead. Not every manager will comply to the renters request, but it’s always an option to ask. Wondering which type of lease is best for you? 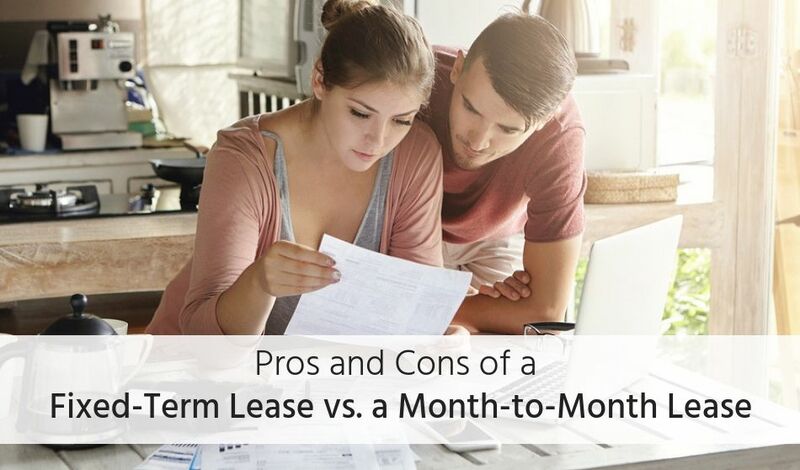 In this article we break down the pros and cons of a fixed-term lease versus a month-to-month lease. A fixed-term lease, or term lease, refers to a rental lease with a designated start date and end date. 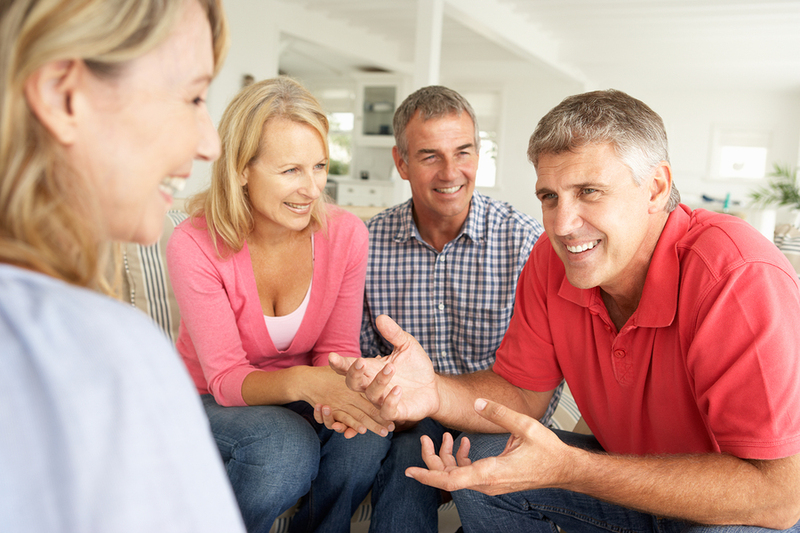 Term lease agreements typically range from 6-months to one year. There are instances, however, of term lease agreements ranging for longer periods of time, like a 2-3 years. A term lease will begin on a specific date stated in the rental agreement. At the end of the term, the tenant will either move-out on a specified date or the term lease will transition to a month-to-month lease. The lease should provide explicit details on what happens at the end of the term lease. It is also a good idea for a landlord or property manager to follow up with their tenants prior to the end of the term lease to remind them what will happen with the lease expires. A property manager or landlord may choose to offer their tenants a renewal option at the end of the lease term. 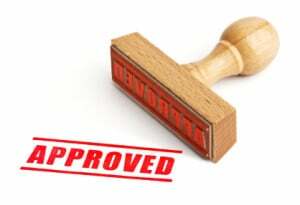 The renewal can be for a fixed-term, similar to the original lease, or the renewal can be for a month-to-month lease. Lease renewals are often accompanied by a rent increase. During a term lease, a landlord cannot change the rental rate mid-term. During a term lease, it is difficult for a landlord, property manager, or tenant to change any lease rules, terms, or conditions. Whatever was stated in the original lease (as long as it complies with state laws), will be the terms and conditions the landlord and tenant must uphold. Managers cannot institute new rules, fees, or conditions during the middle of a term lease, unless both parties mutually agree to an addendum. Guaranteed Occupancy for the duration of the lease. Tenants are required to pay rent for each month through the lease term. A tenant cannot decide to move out mid-term, unless both parties mutually agree to end the lease. And a landlord cannot make a tenant move out mid-term either, as long as both parties are upholding the conditions outlined in the lease agreement and following local and state landlord-tenant laws. Can’t move if your situation changes. During your tenancy, a renter might experience a life change that makes him want to move before the lease is over. Reasons for wanting to move before a term lease is complete include, job loss, job opportunity in another location, family emergency, breakup, or medical emergency. In order to move before a lease is over, a renter might have to pay a lease breaking fee. While a benefit of a term leases is a set rental rate for a given period of time, at the end of the lease, most landlords reevaluate the rental rate and pair a lease renewal with a rent increase. When you are on a month-to-month lease, a landlord doesn’t have a set end date every year that makes a him think about raising the rent, and a renter might go for longer periods of time without a rent increase. Forced to live with bad…neighbors/management/tenants/appliances/roommates/etc. Whether you are a renter or a landlord, there are some personalities that clash. If you are a renter, you might find you just don’t get along with your manager or your neighbors. Personality clashes are not a legitimate reason to break a lease early, so you will be forced to deal with the uncomfortable living situation until the lease ends. This goes both ways, if a manager finds themselves with an annoying, overbearing, or rude tenant, they must continue to rent to them until the lease is over. Exactly as it sounds, a month-to-month lease agreement provides terms and conditions of tenancy for one month. In a month-to-month lease agreement, tenancy and lease terms typically renew automatically at the end of each month. If a tenant wants to move out or if the landlord wants a tenant to vacate the property, the lease will state how much notice must be given. The amount of notice required to change a lease term or to end tenancy in a month-to-month lease is usually dictated by state and local laws. Notice requirements are usually 30-60 days but vary from state to state. In order to change a lease term or increase the rent, the management only needs to follow state and local laws for providing proper notice to tenants. A landlord may choose to change a lease term for things like updating a pet policy or adding maintenance requirements. State and local laws typically require a 30-60 days notice before making updates to a lease. Notice requirements might be different if the lease change includes a rent increase. If the renter wants to move out or if the manager wants the tenant to move, it is a fairly easy process with a month-to-month lease. In a month-to-month lease, the tenant needs to provide notice to management stating he or she plans to vacate the premise on a certain date. If the last day of tenancy is mid-month, the tenant will typically pay a prorated rent amount as agreed upon by management. The amount of notice required should be outlined in the lease agreement and follow state laws. If a landlord or manager wants a tenant to move out they must follow their state laws for a no cause eviction. A no cause eviction is NOT an eviction but provides the tenant with notice to vacate the property on a certain date, even if the tenant has done nothing wrong. Some states or local ordinances prohibit or set limitations on no cause evictions. While sometimes a pro, a month-to-month tenancy means a renter can move out at anytime. For landlords, this flexibility is less than ideal. Dealing with a vacancy at anytime can eat into your cash-flow but if the vacancy takes place during the winter, it can be harder to find a replacement tenant, as wintertime is a notoriously slow leasing period. With rental rates getting increasing attention as they continue to climb, it’s often month-to-month renters who feel the biggest impact from rent increases. While state laws specify how much notice a landlord must give before implementing a rent increase on a month-to-month lease, few state laws put a cap on the amount or number of times rent can increase in a given year. * This is how we hear stories of some renters getting a rent increase of more than 25% in a given year, which can amount to over $1000 in some areas. *Oregon prohibits rent increases during the first year of a month-to-month tenancy. Both fixed-term and month-to-month lease agreements have their pros and cons for landlords, managers and renters. Location, property type, and types of tenants can all play a role on the type of lease term a landlord or manager decides to offer his or her tenants. Management may give a rent discount if a tenant signs a lease for a fixed-term. While other managers or landlord may not give renters that option. Renters have the option to ask their landlords or manager to change the lease term before signing the lease. Regardless of the type of lease term, it’s important for the lease to comply with federal, state, and local laws. Ahhh, lease terms. I go a year which then goes to month to month. That’s also most common in my area (the biggest factor). I prefer fixed term to remove seasonality, ie move-outs in November often cause vacancy till summer. So, I raise rent with option to reduce rent if longer term is established. Regardless, in CA they can bust a lease with two months rent, so it’s almost not worth it, to either party: why sign a m-to-m if your downside is just one month of extra payment? Depending on market timing, it’s often best to just let them go and bring in new tenant at higher amount, but there are slow seasons and slow cycles which are risky. My tenants are usually under market so they never move just to move, only for those ‘life changes’ mentioned, at which point lease doesn’t really matter in People’s Republic of CA. Thanks for the insight on how you manage lease terms in your property. It’s always interesting to hear how state laws effect leasing terms.